Shine brightly from any spot in the room in this gold midi dress that's ideal for making an entrance at a semi-formal party. Defining a feminine silhouette, the shining metallic party dress flows in sharp pleats from the elasticized natural waist, gleaming all the way to the midi hemline. The v-shaped bodice displays the pleated fabric asymmetrically and perfectly aligns with the alluring v-neck and v-back. The midi-length dress provides a modest touch that balances the flashiness of the gold lame, to capture attention from any spot in the room. 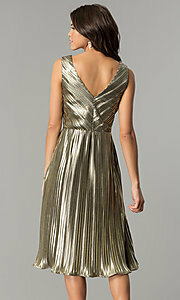 Affordable at under $50, this short semi-formal dress proves that a big budget isn't necessary to flaunt serious style. 42", Hollow to Hem 41"